Our well traveled intern, Temo, has written another great blog for us about his time spent in Venezuela. Read more about his adventures in his previous blog posts, Climbing El Pico de Orizaba and Exploring Northern Baja. To me summer vacations stand for long adventures and exploring foreign countries. When I was growing up, my family and I lived in Venezuela for over 4 years. I have some incredible memories and great friends from that period of my life. A couple of years ago my family and I went back to visit the country and decided to go explore the land that English author Sir Arthur Conan Doyle dubbed as "The Lost World." Venezuela is a beautiful country in the northern end of South America, right next to Colombia and just north of Brazil. It has some of the most varied and spectacular natural environments in the world. You have crystal waters in the Caribbean Sea, vast floodplains in the Llanos, one of the largest rivers in the world that slices the country in half, the Orinoco, and the Venezuelan Andes in the east. In the south of Venezuela you will find a vast wilderness area part of the Amazon Rainforest known as the Gran Sabana, one of the most important natural attractions in the country. Established in 1962, Canaima National Park is located in the south east state of Bolivar close to the borders with Brazil and Guyana. It is a place of unique beauty in the world. It encompasses most of the Gran Sabana and with almost 7.5 million acres; it is considered one of the largest national parks in the world. The park was conceded World Heritage Status by UNESCO in 1994. Canaima holds some of Venezuela's most beautiful attractions. So for our vacation, we flew from Mexico City on the direct overnight to the capital, Caracas, and immediately transferred on a regional flight towards our old home of Puerto La Cruz in the north coastal state of Anzoategui. After visiting old friends and enjoying the Caribbean beaches for a couple of days we set off on the two day drive south towards La Gran Sabana. The drive is pretty straight forward, first day travel from Puerto La Cruz to Ciudad Guyana, in Bolivar state. From here follow route or “Troncal” 10 for another 6 to 8 hours. Along the way we passed some interesting towns, like the legendary El Dorado; known as the epicenter of last century’s gold rush and thought to be the location of the fabled golden city. Today it does not look very golden, but you can still take a tour down some of the gold mine shafts that are still in operation. Keep driving into the jungle until you reach the last small outpost with a gas station simply known as Kilometer 88. From here the road climbs from 40m to 1400m above seal level in less than 10 km up to the flat Gran Sabana wilderness above the jungle floor. Once on top, you are in Canaima National Park and the only paved road goes straight through to Santa Elena de Uairen, the last town before the Brazilian border. 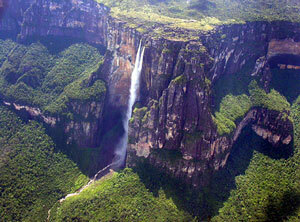 One of the most famous places in the park is the world’s tallest waterfall: Angel Falls or “Salto Angel”. It falls over 1000m from the top of Auyan Tepuy. I remember it was impressive to look up from our kayaks on the river below, but even more impressive was the 2 hour helicopter tour we took that flies around the top of the mountain and into the clouds of mist. You can see for miles and it makes it clear that you are very far away from civilization. The falls are only accessible by small boat or light aircraft from Canaima lodge or Kavak. The best-known features in Canaima are its characteristic flat-topped mountain formations known as tepuis. A unique landscape formed from the oldest exposed rocks on Earth creates the Guyana shield, which is close to 2 billion years old. The imposing Mt. Roraima stands at 2,600 m and it is the largest of the Gran Sabana's magical table top mountains. Ever since visiting as a child, I remember being fascinated with the stories of dinosaurs living up in the mountains in the clouds. For the native indigenous tribes like the Pemones, all the tepuis are sacred and each has a distinct story and personality. So we decided to trek up the tallest and most impressive of them all. The guided ecotourism treks are well planned and organized by several tour companies based out of Santa Elena de Uairen. All the companies that provide eco tours work with the local communities and the park’s management to strictly enforce and restrict the permits issued in order to limit the impact on the sacred land. All expeditions last around 5 to 9 days. The area is protected with a strict leave no trace wilderness policy and the treks are completely self sufficient, which means you must carry all the gear and food for the entire trip and that everything that goes in must come out. Our expedition included local guides/cooks and porters that carried most of the gear and food, leaving us with daypacks for the entire trip. The first two days of trekking are pretty easy, mostly flat surface, following a trail through primal forests and light jungle. You camp along the river that flows from the tepuy in designated camp sites. The meals the guides prepared were very good and made with fresh vegetables and fruits. The mountain rises straight out of the ground up to 2763 m tall, creating a different feel than other mountains once you reach the base. Access to the top is by a steep and narrow staircase like path dubbed “la rampa." When you get to the top you feel like you just entered into the Lost World. Mostly covered by mist and clouds the top of the tepuis are a completely unique landscapes you won’t find anywhere else on earth. 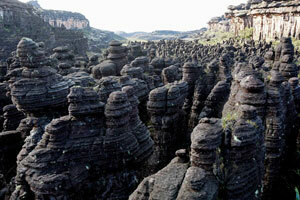 The entire top is covered by incredible rock formations that resemble a Dr. Seuss book. You can find endemic species of plants, frogs and bugs. Describing the top of Mt. Roraima is almost impossible, but you get the feeling that you are on a different planet. It seems the rocks are alive here, creating every shape and size possible. You can spend the entire day just wondering around looking for familiar shapes and faces in the formations. Some formations to look out for are the: stone monkey eating ice cream or the valley of the crystals. We spent two days and one night on top just walking around looking out from different view points (you can see the triple border point where Venezuela, Brazil and Guyana meet) and swimming in pristine rain fed pools. It is truly a magical place that the Pemone Indians consider sacred. After the additional two day hike out, we where very tired and decided to spend a couple days resting nearby some beautiful waterfalls and rivers inside the National Park. Looking back on our trip, I still have vivid memories of the beauty and grandeur we discovered in the jungle and mountains. Trekking into the Lost World is definitely one of the highlights of all my travels. Not just because we found this gorgeous natural wonder, but because I was able to share it with my family, something that seems to be harder and harder as the years passes by. Looking for a unique trekking adventure? We can help! Request a free quote by filling out our custom tour form or calling us at (866) 577-2462.